Hi, yes it is possible to fit at least 25 liters container. I have made a video with 3 bottles - transparent is 5 litre, white one - are 10 liters each. 25+ liters in total. This certain car has a lot of space after the engine. Plus - it is place for exhaust, so no need for insulation. what kind of gasifier would you like to install ? Thank you for reply. I’m thinking of simple-fire like gasifier, Nozzle on bottom, filter cloth on top of it. For kind of hybrid drive, or lets say ~ 50/50% of fuel replacement. NOT for acceleration. Only for cruise. I have tested an small gasifier for lawn mover with honda gv400 engine - made from 20 litres paint bucket - quick&dirty, but it worked. I did some math - i will have 0.0066m3/s of wood gas, or 33 kw in power , for 4 kg of charcoal per hour. or 6 kw of engine power for 20% of engine efficiency. I’ve about decided to go to the dark side on my next project. I know Don and Garry’s nozzle is working great, but I would like to make this an incognito project, which would call for a lower profile gasifier. So now Kristijan, Was the horizontal thick walled pipe nozzle still working well when you retired the Seat? 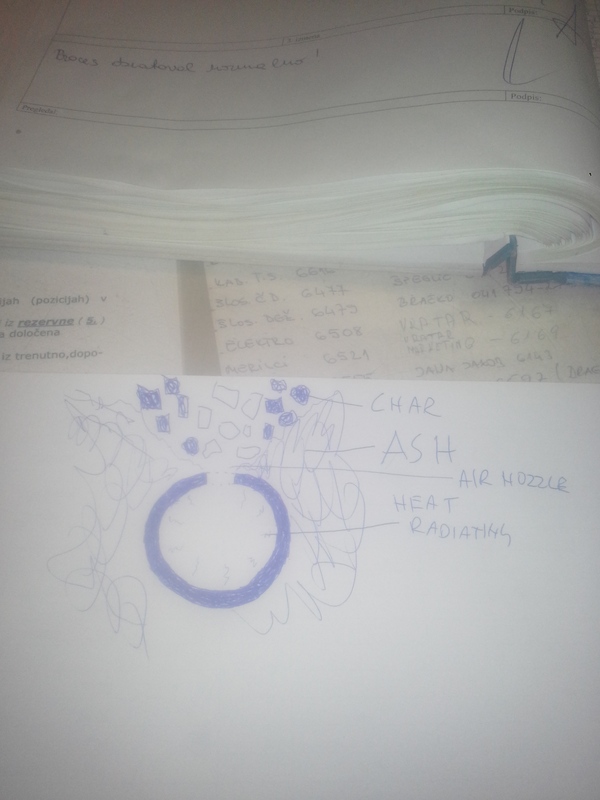 Is there somewhere on the site a picture or diagram of your charcoal gasifier as it existed with that nozzle? Great news! Be sure to keep us posted! Hmm l think there was a diagram somewhere, not of my build, but l think BruceS posted it, not sure. This concept works well as such, but like always, there is room for inprovement. Hope you make a nice sistem. PS, whats the ride with the privilige of being charcoal powered? Hi Andy , there are pictures of Kristijans nozzle on the "Nozzles for charcoal gasifier’s " page scroll down to post 20 it has pictures of his setup . Took the old gasifier out from the dusti shed attic, hope it helps. The metal is intact, rusted from the moisture, but ok. Just awirebrush to clean the ash and rust and its good to go. On top you can see the gas exit mesh. l got nostalgic looking at it… Man l love black gold! Thank you Kristijan and Dave for the responses. I now have some work to do. Now while thinking of long lasting nozzles, this idea came to me. Why not borrow an idea from the fire tube and use fins on the inside of the nozzle to dissipate heat faster that it is absorbed? I would be hard to add fins inside a nozzle pipe, but what about the internal splines on the end of a driveshaft that fit into the back end of the transmission? Seems like that would make a great nozzle. Great idea Andy, even if the splines don’t aid in the cooling the slip yokes are plentiful​, robust and free. Or, maybee drill lots of holes near the nozzles and hammer in tight fitting roundbars, weld on top. This shuld allso boil water on contact in case of water injected sistem. Good after noon krisijan i was checking your charco powered car unit,did you have good results with the radiator cooled air nosel, & did you have too run a fan too keep radiator from over psi.? And would you add a water water jacket or ceramic jacket around the simple fire nosel pipe with plate on top as the Bob Mac unit.Thanks for posting your designs. Not sure of what you mean with radiator nozzle, the nozzle on this sistem and everyone of my later gasofiers was a horisontal thick walled pipe with holes on top. I have the same arrangement in my Mercedes now, about 2000miles driven with no decay to the nozzle. Nope. Just a thick walled pipe with holes drilled on top. No need for any other gadget. I wanted to make a video for you today, to show the nozzle from the inside of my Mercedes gasifier, but didnt have the time. I used no EGR in my Seat gasifier and the ash formed a volcano on each hole in the nozzle pipe, out of molten ash. I use exhaust to cool the reaction now on the MB, wich prevents. Instead, the ash forms a thin lair on the pipes surface and protects it from direct heat. All the heat that gets by radiates in the big pipe to preheat the air. Thanks Kristijan i thought i seen some preheat shuruld there. I dont know if you posted in your thread, but i am currios what kind of miles per pound char on the little car 1.0 got? Thanks P.S Thats an easy too build air supply nosel.